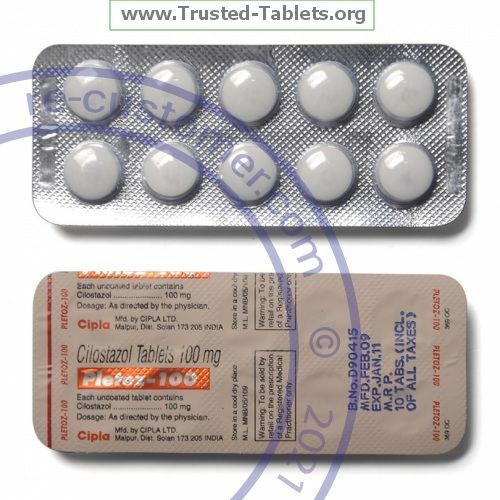 CILOSTAZOL is used to treat the symptoms of intermittent claudication. This condition causes pain in the legs during walking, and goes away with rest. By improving blood flow, this medicine helps people with this condition walk longer distances without pain. Take this medicine by mouth with a full glass of water. Take this medicine on an empty stomach, at least 30 minutes before or 2 hours after food. Do not take with food. Take your doses at regular intervals. Do not take your medicine more often than directed. Visit your doctor or health care professional for regular checks on your progress. It may take 2 to 4 weeks for your condition to start to get better once you begin taking this medicine. In some people, it can take as long as 3 months for the condition to get better. Smoking may have effects on the circulation that may limit the benefits you receive from this medicine. You may wish to discuss how to stop smoking with your doctor or health care professional.